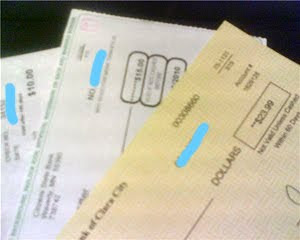 The rebate centers must be working overtime because I've been receiving checks daily for over a week. One of the main issues people have with rebates is how small the checks are. I've never understood this. A bunch of small checks are just as valid as one large check! At most you take up a teller's time or need to do some math at the ATM. I wouldn't be in danger of a mugging flashing any of these babies but they add up to almost $50. Why wouldn't someone want $50?